Faizal R: Swithcing to Google+ profile in Blogger. Swithcing to Google+ profile in Blogger. 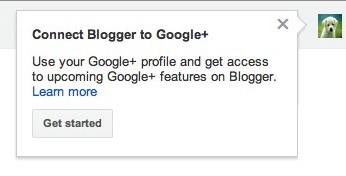 If you have a Google+ account and would like to replace your Blogger profile with your Google+ profile, log in to draft.blogger.com and click “Get started” on the promotion message, pictured below. People want more integration with Google+. Let Google+ user fetch their new blog post automatic to Google+. Great...it will replace my manual way to share on G+...happy blogging!